Open fracture (also called compound fracture): The bone pokes through the skin and can be seen, or a deep wound exposes the bone through the skin. Closed fracture (also called simple fracture). The bone is broken, but the skin is intact. Greenstick. This is an incomplete fracture. A portion of the bone is broken, causing the other side to bend. Transverse. The break is in a straight line across the bone. Spiral. The break spirals around the bone; common in a twisting injury. Compression. The bone is crushed. This causes the broken bone to be wider or flatter in appearance. Comminuted. The bone has broken into three or more pieces and fragments are present at the fracture site. Segmental. The same bone is fractured in two places, so there is a "floating" piece of bone. Fractures most often happen when more force is applied to the bone than the bone can take. Bones are weakest when they are twisted. Bone fractures can be caused by falls, trauma, or as a result of a direct blow or kick to the body. Overuse or repetitive motions can tire muscles and put more pressure on the bone. This causes stress fractures. This is more common in athletes. Fractures can also be caused by diseases that weaken the bone, such as osteoporosis or cancer in the bones. The symptoms of a broken bone may resemble other medical conditions or problems. Always see a healthcare provider for a diagnosis. X-ray. A diagnostic test which uses invisible electromagnetic energy beams to make pictures of internal tissues, bones, and organs on film. 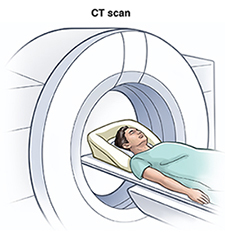 Magnetic resonance imaging (MRI). An imaging test that uses large magnets, radiofrequencies, and a computer to produce detailed pictures of structures within the body. The goal of treatment is to put the pieces of bone back in place, control the pain, give the bone time to heal, prevent complications, and restore normal use of the fractured area. Splint or cast. This immobilizes the injured area to keep the bone in alignment. It protects the injured area from motion or use while the bone heals. Medicine. This may be needed to control pain. Traction. Traction is the use of a steady pulling action to stretch certain parts of the body in a certain direction. Traction often uses pulleys, strings, weights, and a metal frame attached over or on the bed. The purpose of traction is to stretch the muscles and tendons around the broken bone to help the bone ends to align and heal. Surgery. 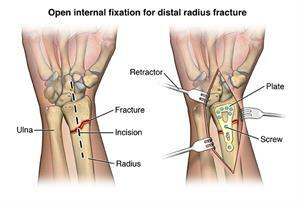 Surgery may be needed to put certain types of broken bones back into place. Occasionally, internal fixation (metal rods or pins located inside the bone) or external fixation devices (metal rods or pins located outside of the body) are used to hold the bone fragments in place while they heal. Fractures can take months to heal as broken bones “knit” back together when new bone is formed between the broken parts. What can I do to prevent fractures? Follow a healthy diet that includes vitamin D and calcium to keep bones strong. Do weight-bearing exercises help to keep bones strong. Do not use any form of tobacco. Tobacco and nicotine increase the risk of bone fractures and interfere with the healing process. Osteoporosis is a common cause of fractures in older people. Talk to your healthcare provider about your risk of osteoporosis and get treatment if you have it. You should see a healthcare provider any time you think you may have a broken bone. An open fracture (one in which the bone comes through the skin so you can see it or a deep wound that exposes the bone through the skin) is considered an emergency. Get medical attention right away for this type of fracture. Any injury to the bones of the spine is also a medical emergency. These cause severe back pain and may cause nerve problems. These include numbness, tingling, weakness, or bowel/bladder problems. Call 911 if you suspect a person has a break in the bones of their spine. A fracture is a partial or complete break in the bone. There are many different types of fractures. Bone fractures are often caused by falls, trauma, or as a result of a direct blow or kick to the body. Overuse or repetitive motions can cause stress fractures. Fractures can also be caused by diseases that weaken the bone. These include osteoporosis or cancer in the bones. The main goal of treatment is to put the pieces of bone back in place so the bone can heal. This can be done with a splint, cast, surgery, or traction.